Xtext 2.1 made it even easier to access Java types from your DSL; you can find some paragraphs in the documentation. In particular, the new features of Xbase seem to make this integration even more powerful! This paragraph in the documentation briefly describe how to refer to Java elements using JVM Types, and then dedicates much more room to accessing Java Types using Xbase. In this post, I’d like to document some my experiments/experiences in accessing JVM Types without using Xbase, and in particular, not by using the good ol’ Domainmodel example, but something even more simpler, so that I could concentrate on the issue of using JVM Types (and not with more involved features of the DSL itself). The defaults for the created project are already fine for accessing JVM Types, so we don’t have to tweak the mwe2 file. and we are now ready for accessing JvmTypes from our grammar. 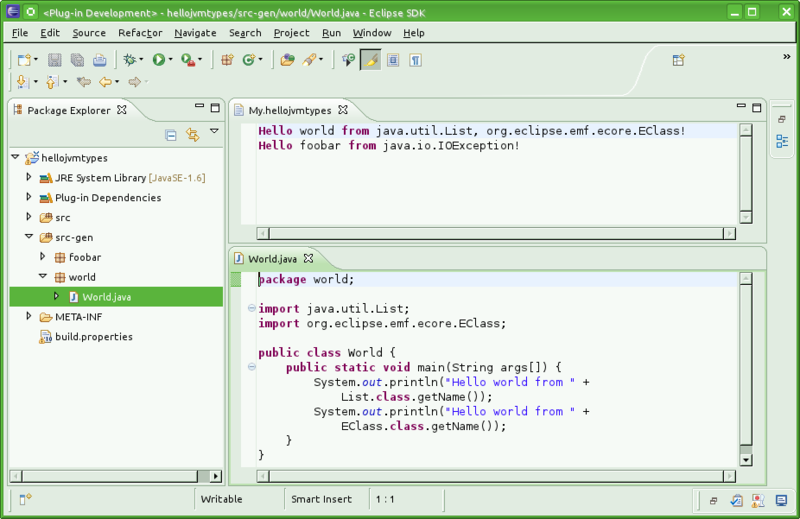 Hello world from java.util.List, org.eclipse.emf.ecore.EClass! and from these sentences, generate some Java classes that simply print the same strings. 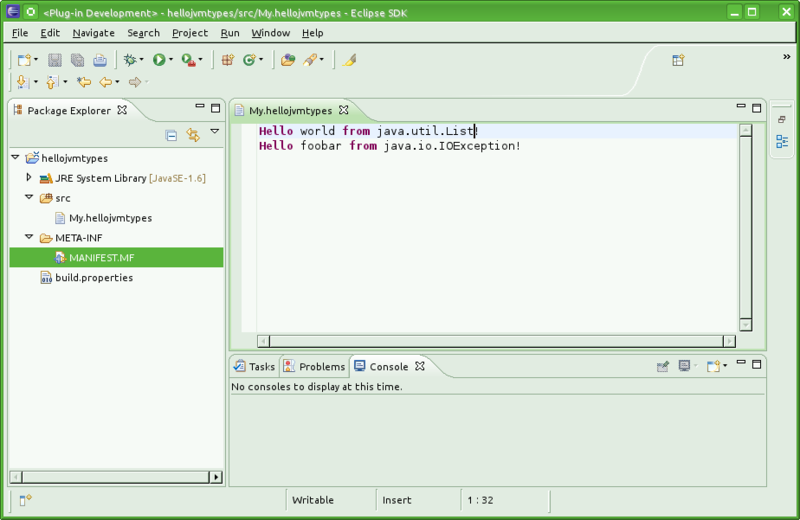 Note that also the content assist for Java types works! (if you didn’t type anything where a JvmType is expected and you ask for content assist you might experience some delays because the proposals consist of all the visible Java types in your project). Note also that only the Java types which are “reachable” from your project’s classpath will be actually visible. 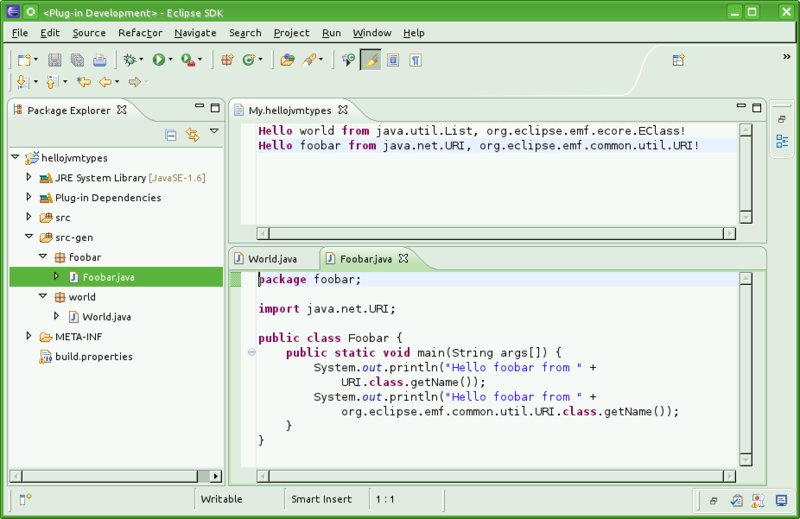 For instance, try to use org.eclipse.emf.ecore.EClass and you’ll get an error (if you created a simple plugin project). 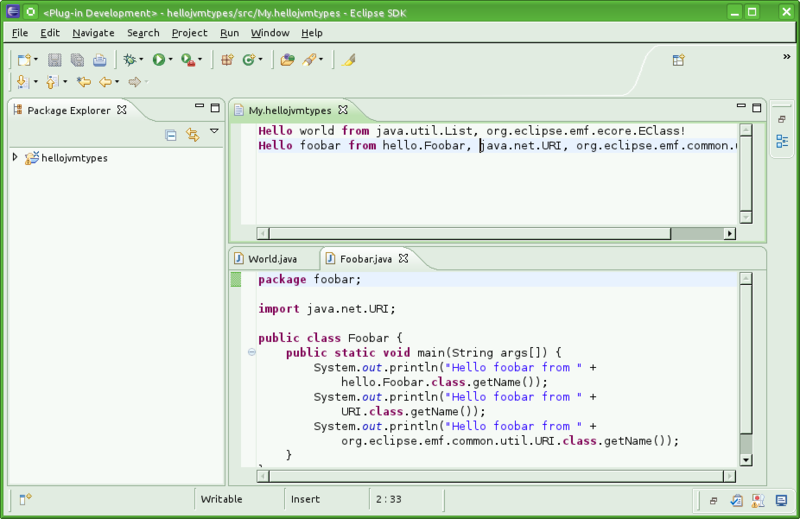 Now, try and add org.eclipse.emf.ecore as a dependency in you project MANIFEST file and you’ll then be able to access its Java classes. Before we go on with code generation, let’s do some unit testing! 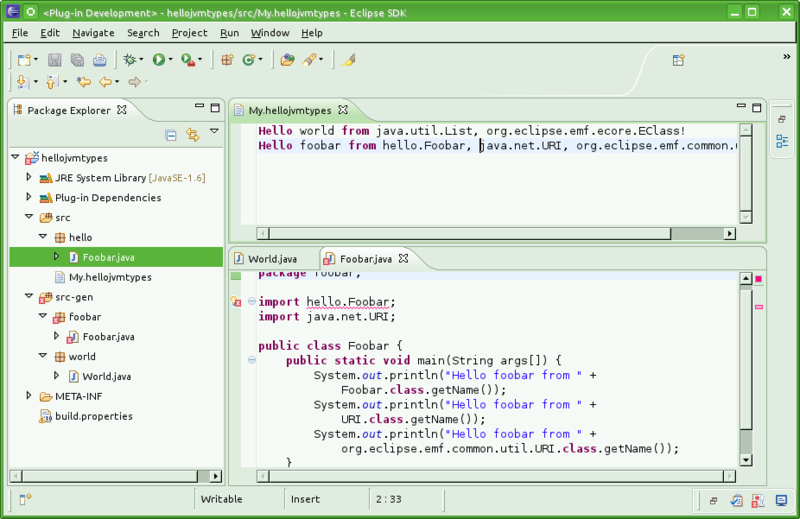 Create an Xtend2 class in the tests plugin project org.xtext.example.hellojvmtypes.tests and add in the MANIFEST org.eclipse.xtext.xtend2.lib as a dependency. 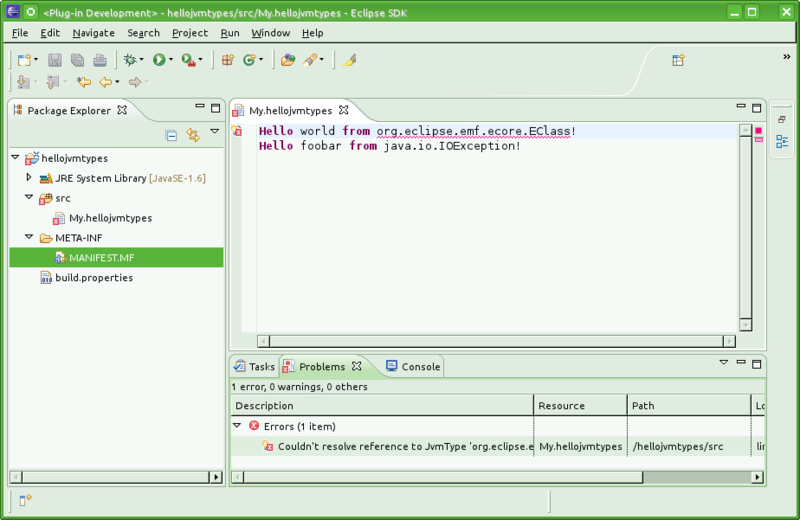 If you run the corresponding generated Java class as a Junit test you’ll see the green line! 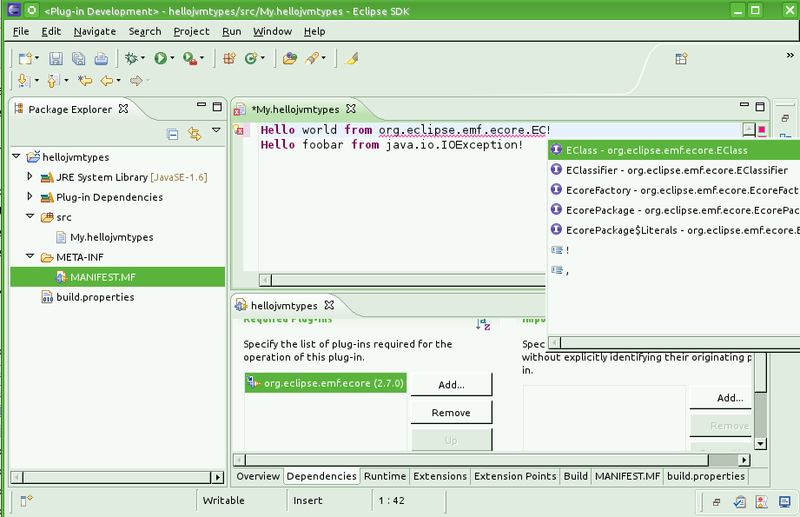 Before explaining the code above, let’s try the generator: restart your second eclipse instance, and make sure that in the project you had created with the hellojvmtypes file you have a folder named src-gen, and that folder is configured as a source folder. You should now see the code generated automatically in src-gen: in particular you will end up, for each Greeting element with a package and a class named according to the Greeting name feature (package all lower case, and class name with the first letter capital). Moreover, the generated main method will print the corresponding greeting. 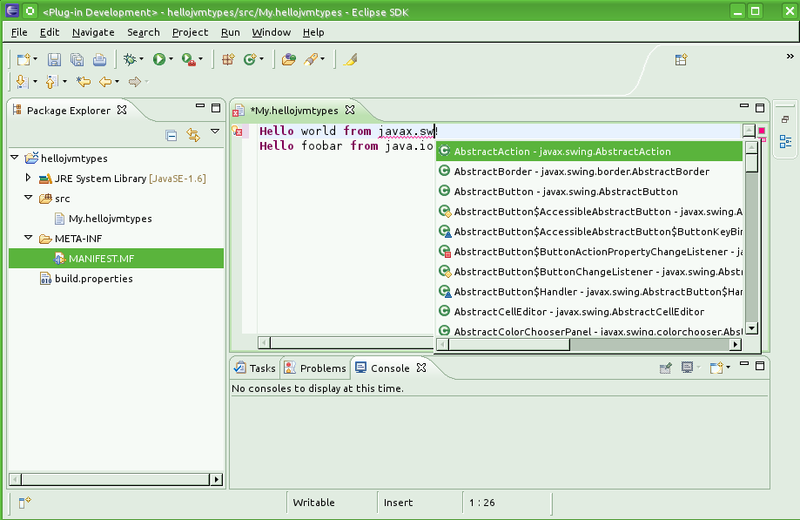 thus, we then generate all the Java import statements, and then the actual Java class (that we buffered into a string). For instance, see how the ImportManager correctly (and transparently) handles possible Java class conflicts in the generated code (due to the class URI which appears in different packages). So far, so good! But what happens if we refer to a Java type which, by chance, has the same class name of the class we’re generating? For instance, in the src folder create a class hello.Foobar and refer to it in your My.hellojvmtypes and see the generated code… argh! We get an error! where you specify the JvmDeclaredType of the Java element which will contain the accesses to Java elements we are generating through the ImportManager itself. Thus, we only need to create on the fly a JvmDeclaredType corresponding to the Java class we are generating for the Greeting element! now, restart the other eclipse instance, and regenerate the code for My.hellojvmtypes, and see now the correct generated Java class!